MEXICO – Communicating a message to a person or a society that is optimistic, hopeful and growing, requires a different process than addressing someone who is stressed, insecure, unsure of their future society, or is continuously subjected to bad news or personal or social failures that demoralize them. Political communication – to be called such – must consider, above anything else, the state of mind that hears the message, what is going on in the consumers’ brain and – as such – the inner murmurs of the society’s spirit. Without this type of communication – without this method – messages and characters fail, falling into oblivion, being ignored or rejected offhand. We could call it ‘communication without a subject,’ a blind message that lacks the precise aim supplied by the knowledge of a unique and forever changing society. In Mexico (and many parts of the world) political communication is designed vertically, coming only from a war room, or think tank, and staking it all on the genius (either real or perceived) of a political operator and his/her team. A message is imagined, an information capsule is modeled, a slogan is written and off to the public arena we go …. This is usually a very unfortunate course of action. We believe we must work exactly backwards. We must first study the subjects the communication is directed to, their personal circumstance and their social mood, and through that dynamic and analysis we build our messages. That is the starting point of this article. A few years ago, political campaigns in Mexico were common place: repetitive, boring, with a vague remembrance of a relevant message and far from getting people riled, they mostly generated rejection and upset. … we believe that there is divorce between the elite, especially the ‘political class’ and the population. This is becoming an ever-growing abyss that is unassailable: nothing the ‘politicians’ say is credible or deserving of attention and reflection. Our democracy and elections are mediated by a big wall located between parties and candidates, citizens and voters. We believe that very few have taken this leap on the concept of political communication, which mostly explains the failed and broken campaigns; the divorce between political communication and impacting or reaching voters. The issue is that simple marketing that offers manufactured data and messages is the still dominant process followed by political communicators; and this has the defect of not considering either the social mood, the history or context, or the type of society it represents. Today’s Mexican society is not the same as in 2000 or 2010, much less than of the 1990s of last century. A series of processes, happenings, perceptions, and especially broken expectations, have molded a spirit loaded with worries and despair. Of course, the whole country has not evolved in the same fashion, or the same scale, nor at the same speed. However, the general tendency over the last two decades shows that Mexican society is one that is tired of failing and hearing empty promises, with few opportunities for growth and building a better future, where the doors close, without an exit in sight. 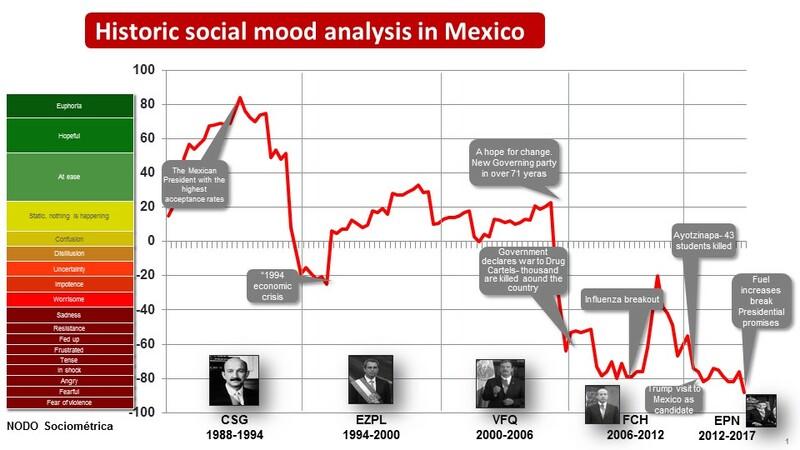 This fact is not exclusive to Mexico, of course – much less after the great crisis that convulsed the world’s economy – but Mexico’s social mood had a deeply seated pessimism since the mid-90s and the so called ‘Tequila Effect’ crisis. Our social mood research starts there: when we realize that something is failing in the many communication attempts, both in commerce and politics. A wall was being erected around Mexican consumers, and the messages transmitted by corporations or governments and not impacting people’s minds, or are rejected, or perceived as not trustworthy, or even annoying. The first column shows a social mood ‘thermometer. The bottom shows the six-year-long presidencies since 1988. The table shows dramatic changes going from Euphoria to Disillusion in only three years. It is like a roller coaster for the mood in Mexican consumers. Spokespeople, institutions, brands, media, political candidates and a long list of political parties made immense efforts – sometimes heroic ones – to reach out to consumers, but they were all insensitive and out of phase with the public. You can see the worrisome history of this phenomenon in the graph. The simple data battery of empiric correlations show that the two preceding decades are not a stage of stability, but rather contingent oscillations of suspended activity: jobs, productions and income. In these fluctuations, society has become more unequal. Episodes in Mexico’s recent economic history can be appreciated in the graph: the fall of our external accounts and banking system in 1994-95; the longest recession in modern history (38 months) between August 2000 and September 2003; the effects of the financial crisis in 2009; a continuous deceleration of the economy during the second semester of 2012 with a virtual recession in 2013 and a downside expectation for 2016 and 2017…. That’s it for economics, but there is also a role to be played in events and how they affect social mood: the expectations generated during the regime of President Carlos Salinas; the arrival of the democracy and the triumph of Vicente Fox; the post-electoral crisis in 2006; the everyday news of violence and killings in the country; the capture and jailing of Elba Ester Gordillo, the tragedy of Ayotzinapa and the 43 disappeared students; the escape of El Chapo and many other news events and circumstances play a role as relevant as the economics. These feelings have been typed through a carefully designed system that has allowed us through the last few decades to map out the growth, diminishing or resurgence of patterns of behavior among Mexicans. Different rationalities and sensibilities are mapped out by segment. For example, the optimist (ever in decline), negative, evasive, and the aggressor – citizens whose frustration makes them prone to violence and intolerance. Our methods have been applied to other countries also facing processes of degradation in perception, emotions and vision by their citizens. But the Mexican case is unique, because it has been at the bottom of the international scale for decades. A piece of data: Mexican women are the most stressed out in the world, after women in India …. To summarize: Our society has changed massively in the last 20 years, but not in a positive way. All these factors determine conducts and moods, and therefore, a type of sensibility that evermore admits less and less the traditional messages and characters of the governing people. Therefore, political communication (democratic, I’d say) has become so hard, so unempathetic. It needs to be updated quickly. This is perhaps the most difficult time of communication, because consumers/voters have accumulated a lot of broken expectations. (1) Before continuing on the central subject, allow me to clear up that ‘Social Mood’ has its roots in the works of celebrated philosopher Gilles Lipovetsky (The age of emptiness and the Empire of the Ephemeral). However, the concept was extremely useful for the work of moderators and the social analysis of the data, in such a way that NODO patented a novel methodology, making it a trademark under the same name Social Mood (Humor SocialR by its name in Spanish) exported to the US, Chile and Colombia among other countries. (2) Benjamin Friedman: The Moral Consequences of Economic Growth, Vintage Books, NY, 2005, P 15.